Oops - we don't appear to have a video for the ScanSnap fi-5110EOXM (Mac). I think that the Fujitsu ScanSnap Fi-5110EOXM is generally a good scanner and would mark it six out of ten. What I found was that the software was easy to install and similarly using it was fairly straight forward. I was impressed by the scope of options to choose from which in fact covered all my needs. I was very impressed with its speed and also the quality of the scans. At its highest resolution setting I even used it to scan in some art work, which it did admirably. What lets it down is the document feed aspect. There is no way that you can leave it unattended to get on with processing a batch of papers. If it doesn't catch the document accurately it will feed through a page with up to two others concealed behind. That way you can loose valuable information. It also has a tendency to jam but the reset is pretty easy and straight forward to implement. - if it works, leave it be. In my search my attention was drawn to the pdf organisational software on offer to PC users. This would a really welcome aspect to come to the Mac platform. Overall this is a very good and efficient sheet fed scanner that's been impressively bullet-proof in almost daily use as a home office tool. The only real problem (for which I'd be very grateful for a solution) is that the pdf format scans display fine on screen but print out completely skewed across the page. Very weird. No such problem with any other scanner I've used on the same machine (Dual 2GHz PowerPC Mac G5 running OS 10.4.7). We're very enthusiastic about the Fujitsu Scansnap that we purchased from you. It scans well and quickly; the software is user-friendly; the tiny footprint is a big advantage. The only occasional problem, which we don't find troublesome in light of our overall satisfaction, is with the paper feed, which sometimes jams or takes multiple pages at once. A complete desktop solution, simply press one scanner button to convert colour or mono, multi page, double sided documents into digital PDF files which you can file, organise, share and email with ease. The Fujitsu ScanSnap Fi-5110EOXM scanner for Mac software automatically creates Adobe PDF files which have become the de-facto standard for document exchange, enabling you to send documents anywhere in the world safe in the knowledge the receipient will see the document exactly as you see it. 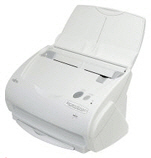 To make scanning as simple as possible, the Fujitsu ScanSnap for Mac inspects each document to decide if a document should be scanned in black and white or colour, what the size of the page being scanned is and eliminate blank pages, all of which serve to speed the scanning operation and minimise your storage requirements. In addition each document will have misaligned text corrected (Auto Deskew) and each page will be have its orientation automatically adjusted. The Fujitsu ScanSnap for Mac incorporates a 50 page automatic document feeder, duplex capability and colour scanning within a surprisingly small footprint.